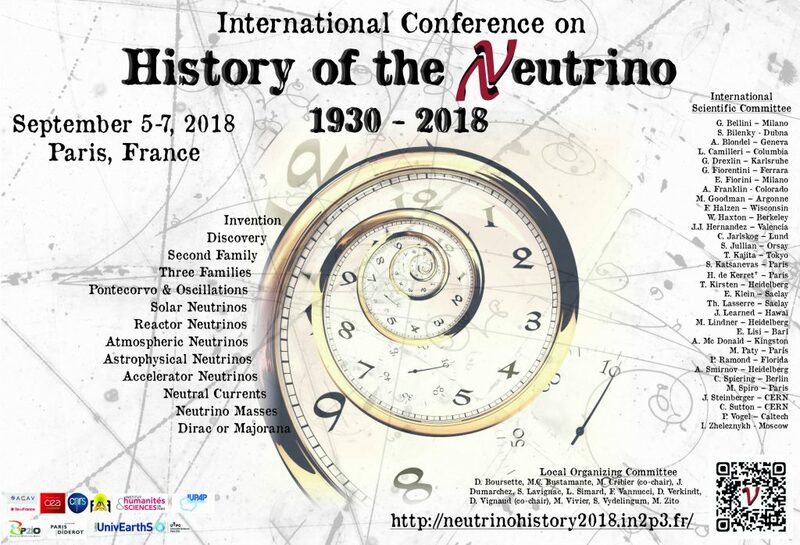 UnivEarthS is pleased to support the international Conference on History of the neutrino, to be held on September 5-7, 2018 in Paris. Neutrinos play an exceptional role as well in particle or nuclear physics as in astrophysics. The purpose of the Conference is to cover the main steps of their History since the brilliant and inspired idea of Pauli in December 1930. Though trying to cover all the facets of this fascinating particle, it should be considered as a contribution to the History of the Neutrino, since some chapters are still to be written. The objective is, on each topic, to have a historian/historical approach and follow as close as possible the original papers in correlation with the scientific and historical context. Most talks will be invited talks. However, we will welcome contributions by authors who would like to give their personal testimony on a topic (a committee will select between oral and/or written contributions and/or posters).